and former Pace University adjunct professor of international law. Pace University New York City students and faculty have been working hard for a nuclear weapons free world at the United Nations for the past month, as member states review the implementation of the nuclear Non-Proliferation Treaty. Kyla Korvne ’15 and Caitlin Boley ’16 both participated in a youth delegation to the conference, organized by the non-profit Ban All Nukes Generation (BANg), monitoring the conference as it met in the UN General Assembly Room and other august locations. “I firmly believe that nuclear weapons are the number one threat to global and human security today,” said Caitlin, a political science and philosophy and religious studies double major, who has participated in Pace’s award-winning Model UN program. Kyla, an honors political science major and peace and justice studies minor, agreed, saying, “It was a privilege to be a young person involved in a cause that my generation tends to ignore.” Kyla has won several awards for her excellent diplomatic skills in Model UN conferences in Washington DC, Geneva and Oslo. To read a blog post reflecting on her BANg experience, click here. 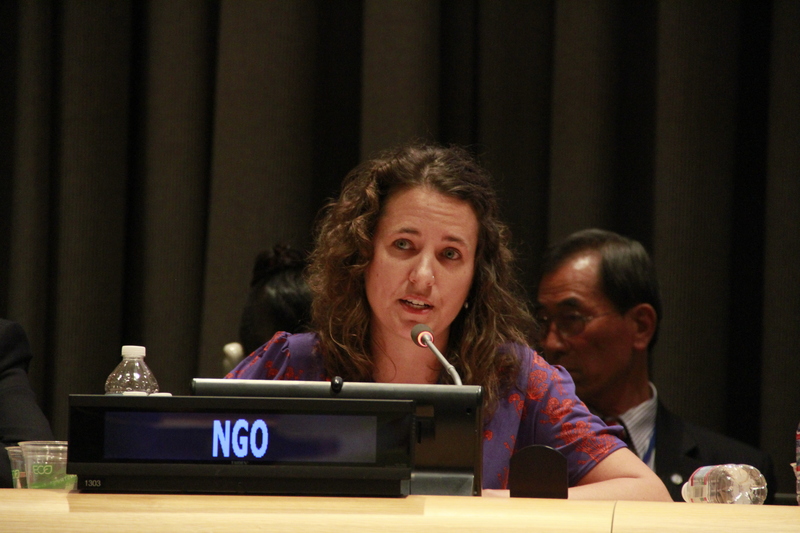 Dr. Emily Welty, director of Pace NYC’s peace and justice studies program, delivered a statement at the UN on behalf of religious communities in her capacity as Vice-Moderator of the World Council of Churches Commission on International Affairs. “The continued existence of nuclear weapons has forced humankind to live in the shadow of apocalyptic destruction,” said Dr. Welty, who monitored the negotiations closely, met with numerous countries’ delegations to make sure they were aware of interfaith and ecumenical perspectives on nuclear disarmament and generated social media content. Dr. Welty and Dr. Matthew Bolton, assistant professor of political science and Model UN advisor, were later featured on a panel on “general and complete disarmament” hosted by the Costa Rican mission. Just before the beginning of the NPT Review Conference, April 24-26, Pace students and faculty helped organize the International Peace & Planet Conference for a Nuclear-Free, Peaceful, Just and Sustainable World, attracted 600 leading activists, scholars and diplomats from more than a dozen countries, including survivors of the Hiroshima and Nagasaki Atomic Bomb attacks and Angela Kane, U.N. High Representative for Disarmament Affairs. Pace, along with the Cooper Union and Hunter College, hosted several of the conference workshops. The following weekend, Pace hosted an all-day strategy meeting of Abolition 2000, a network of thousands of nonprofit organizations, both national and international, working on nuclear issues. Participants heard from luminaries like New Zealand Member of Parliament Phil Goff and Ambassador Yasuyoshi Komizo, Secretary-General of the Mayors for Peace; but many reported that they were most captivated by the opening speech from Elena Marmo ’15, head of Pace NYC’s Student Peace Alliance and a Model UN head delegate. “I have spent the past four years of my time here at Pace engaging with faculty who call for civic engagement and with students passionate about social change,” said Elena, an honors political science major and peace and justice studies minor who at graduation this May received Pace’s highest Trustee’s Award, alongside awards for academic excellence in political science and peace and justice studies. Located only two express subway stops from the iconic United Nations complex on the East River, Pace University’s scholars actively engage with global policymaking debates. The strong representation of Pace at the NPT is indicative of the university’s broader engagement with the UN. In the last few years, students and faculty have worked closely, particularly with civil society, in the Commission on the Status of Women, the Permanent Forum on Indigenous Issues, the UN General Assembly First Committee, the Convention on Certain Conventional Weapons and Arms Trade Treaty. “Pace faculty and students have made a significant contribution to international work on disarmament and, in particular, the growing movement to frame disarmament as humanitarian action,” said Thomas Nash, director of Article 36. For example, last fall, Pace hosted the Humanitarian Disarmament Forum, which featured Nobel Peace Prize Laureate Jody Williams as well as many other notable speakers from the media, diplomacy, academia and non-profit sector who are working on the intersections between gender and arms. “The value of both formal and informal advocacy and academic engagement has been proven repeatedly by both Pace University faculty and students,” Susi Snyder of PAX, a Dutch non-profit working on peace, disarmament and security issues that will host a Wilson Center-funded Pace intern this summer. Pace University has a 65-year history of excellence in regional, national and international Model United Nations conferences and encourages its students to develop the skills and capacities needed to thrive as global citizens. Drawing students from around the world, Pace has numerous academic programs related to international affairs, including political science, peace and justice studies, women’s and gender studies, global Asia studies, international management, Latin American studies, modern languages and cultures, and environmental studies. This entry was posted in Uncategorized and tagged Model UN, NPT2015, Nuclear Non-Proliferation Treaty, Nuclear Weapons, Pace University, United Nations. Bookmark the permalink.